People encounter a variety of problems when trying to get out of debt and on the road to becoming financially wealthy. One of the most common of these problems is not knowing where the money is going in the first place. You may know where the major portions of your income were spent, but there always seems to be some money that just disappears. The spending journal is a tool to help you figure out where that money is disappearing to. Often times, we spend little bits of money here and there without even thinking about it. It is astounding how many times these little bits of money add up to a significant portions of our income. In my financial counseling ministry, it has been my experience that the things people think are causing their financial problem, aren't usually what actually is causing it. More often than not, the problem stems from the little bits of money that people spend without giving it any thought. The spending journal is nothing more than a tool to help you figure out where all these little bits of money are going. In fact, the spending journal shows you where all of your money is actually going. Very simply, for a period of time, you keep track of every penny you spend--EVERY PENNY. 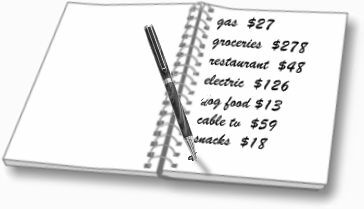 Each time you spend money, no matter how large or how small an amount, you write it in your spending journal. Now don't get carried away. You don't have to write down too much information. Doing a spending journal is already demanding and tedious--there is no need to make it any harder than it needs to be. Just write down how much you spent, and what you spent it on. You don't have to write down where you were, the time, the date, or any of that stuff. Just how much you spent and what it was for. What you do have to remember, though, is that all spending has to be entered in the journal. You are not allowed to decide that something costs so little that its not worth writing down. It doesn't matter if you spend hundreds of dollars on something, or just a penny, it MUST be written in the journal. If you cheat by not entering every penny you spend, then the journal may not be very effective and might not be worth doing. If you decide to do a spending journal, then take the time and effort to do it right. Keep a spending journal for a minimum of one month. If you can go two or three months, that's even better and will be more helpful to you; however, doing a journal for one full month is usually adequate. What to do with the information. After you have kept a spending journal for at least a month, it's time to analyze the information and learn something from it. The whole purpose of the spending journal is, after all, to help you with your finances. When doing a budget, you have different spending categories. These are simply things like housing, food, transportation, clothing, etc. Go through your journal and look at all of the things you spent money on. Group your entries into what budget categories they would fall under. In other words, if you spent money on gasoline, than that would go into transportation. Money spent eating out, would go into your entertainment category. Rent/Mortgage payment would go into housing, as would utility costs. Then, use the techniques learned in the article about creating a budget, to see if you are overspending in any particular categories. For example, if your entertainment budget is supposed to be 5% of your monthly income, and your spending journal shows that you spent 17% on entertainment, then you know you have to make some cuts in your entertainment spending in order to balance your budget and start getting ahead financially. You do the same thing with all other entries in your spending journal. You cannot skip anything. Every single thing on which you spent money has to go into a category. Then, look through your journal for any little bits of money you spent without even thinking about it. This will often be money spent on such things as eating out, snacks, impulse items at the grocery store, movies, videos, drinks, items on sale at the store, etc. When you add up all of these little bits of, seemingly insignificant, amounts of money, you may be surprised. It is not unusual for these little bits of money to add up to over $100 in a single month. Often, this type of spending can add up to several hundred dollars per month. Remember that, if during the one month of your journal you spent just ten dollars on extra things you didn't need and didn't think about, it adds up to $120 a year. And most people will find that they spend far more than just ten dollars per month on "extras." That's the power of doing a spending journal: it generally shows you many different places that you can reclaim some of your income and use it for other things--such as eliminating debt. The big surprise that most people have after doing a spending journal, is how much money they were spending and never really paid attention to where it was going. That is how your spending journal helps you to get ahead. It shows you budget categories in which you are overspending, and it shows you where money is being spent without you even realizing it. Quite literally, a spending journal shows you where all of your money is really going. Not where you think its going, but where it really is going. That knowledge gives you the power to then decide where your money will, and will not, be spent from then on. Essentially, you have much better control of your money. Now, you can apply all of the other things you are learning on The Financial Page to start eliminating debt and saving money for your future. This article copyright © 2009 by Keith C. Rawlinson (Eclecticsite.com). All rights reserved.